Hi 8 Pro USB-C port is USB 2.0 only!!!! TechTablets › Forums › Chuwi Forums › Chuwi Hi8 Pro Discussion › Hi 8 Pro USB-C port is USB 2.0 only!!!! This topic contains 13 replies, has 5 voices, and was last updated by ric hey 2 months, 1 week ago. I tested many USB-C to USB 3.0 cables and HUBs, I’m sure tablet’s USB C port has only USB 2.0 speed. X5-Z8300 SOC has USB 3.0 controller with 3 USB 3.0 and many USB 2.0 connection, but crazy engineers from Chuwi conneted SD card reader and USB -C port to USB 2.0 parts of controller. It’s very very annoying. That USB-C connector supports only up to USB 2.0 speeds is not exactly news here. There are a few threads dealing with that issue. Now explain to me how ChuWi engineers did a poor job when z8300 does not support USB 3.0 off SoC. Page 17, USB devices – USB 3.0 – Not supported (our SoC package is T3 aka z8300). You can see that we have 3 USB 2.0 connections coming from SoC, that’s it. Consequently, SSIC (built on top of USB 3.0) is not supported, and there are 2 HSIC (built on top of USB 2.0), so probably there’s one more USB PHY inside. Having dedicated USB 3.0 silicon – like it was 5 years ago on Intel boards whose chipset didn’t support USB 3.0 natively – would increase heating and price of this tablet, neither of which would result in a competitive product. T3 aka z8300 has one USB 3.0 OTG port! When my HP ENVY 8 Note arrives next week, I will investigate this further, as I have no other z8300 here. I know you read my benchmark comparison thread http://techtablets.com/forum/topic/micro-sd-benchmark-comparison/ as you commented there with your findings. 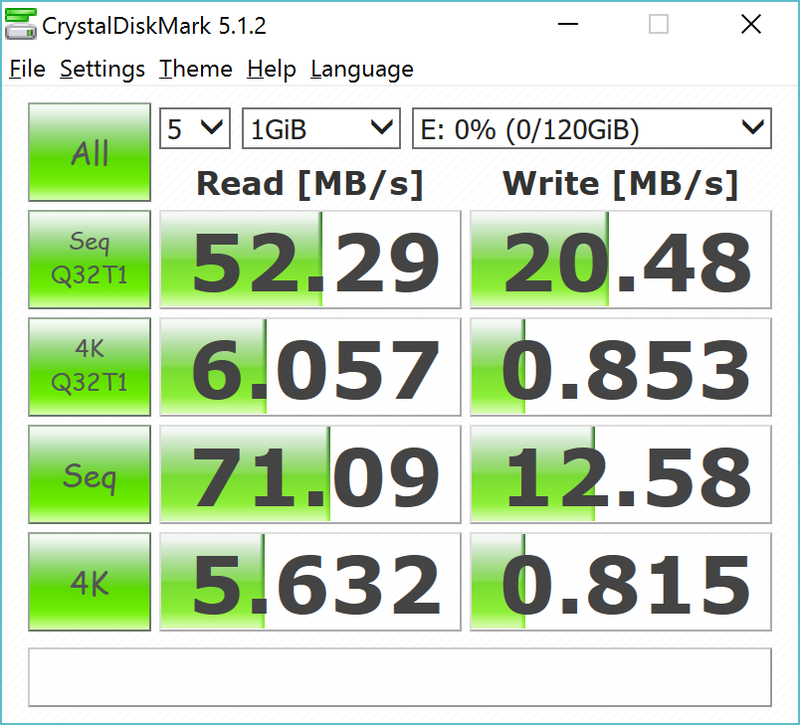 If SD card reader was connected via USB 2.0 (hint: it’s not) how do you explain sequential reads in my measurements going at 71 MB/s? Btw, theoretical top speed of USB 2.0 is 480MBit/s (60MB/s). I still find it amusing that Hi8 Pro 4K operations outperform Surface 3 Pro with the same card. So no more than 50Mb/s. Chuwi Hi8 pro, Cube iWork 10 and Onda Obook 10 all have Z8300 SOC. 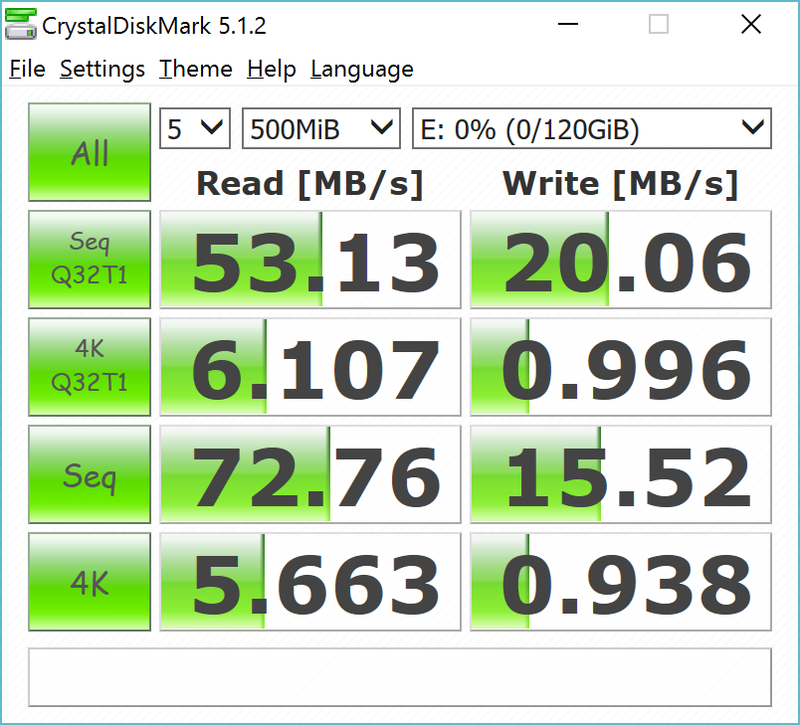 I decided to redo benchmarks with different sample sizes: 1GB, 500MB, 100MB. Numbers are still above theoretical maximum of DDR50, so I suppose they left the bus in SDR104 mode despite Intel recommendations. Note: I have earlier series single OS Hi8 Pro, which is not being sold anymore (as far as I know) due to its many problems. So it’s possible that it has different implementation than yours. As you said, it is possible that manufacturers are not following Intel’s recommendations, and doing their own stuff. Without their motherboard schematics we can just speculate here. One thing is clear, numbers I’m getting from this card are quite decent, so at least I’m happy with this aspect of the tablet. 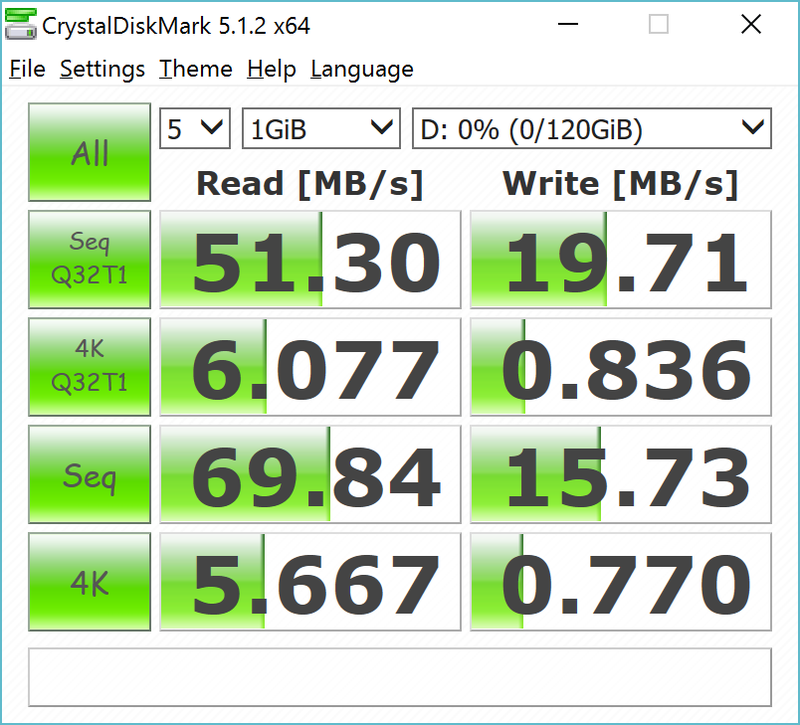 I tested four 64GB SD cards, and I did not measure more than 40GB/s. Those cacards performed better with Obook 10 (54-85GB/s). May be we have different revisions of tab. Yes, I suspect they did different implementation of things in different batches. 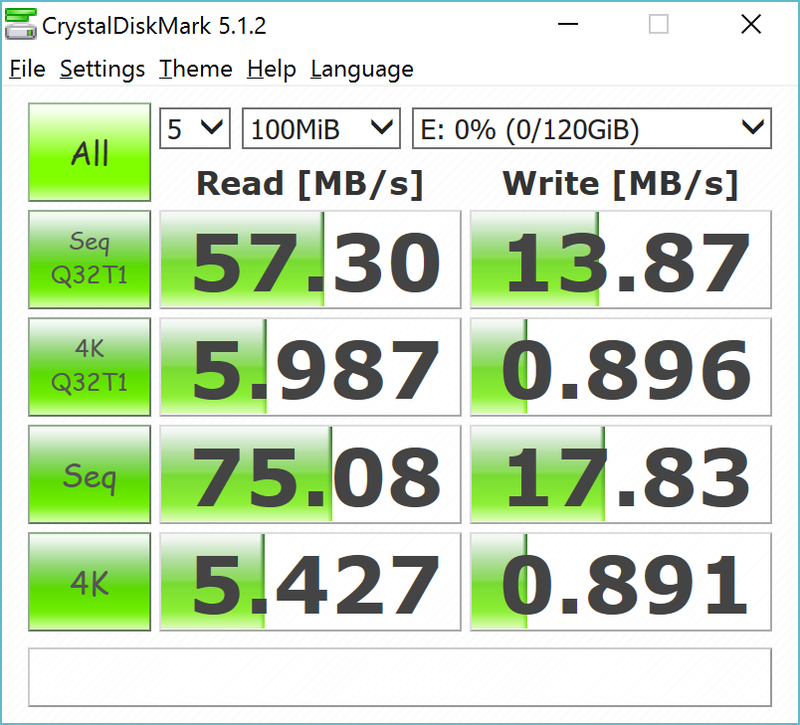 As promised, I uploaded SD card reader benchmarks from HP Envy 8 Note I got hours ago. Results are very similar to Chuwi Hi8 Pro which reinforces my theory that your tablets have additional electronics inside for card reader. Rev2 of the Cube iwork10 which has a USB-C connector is USB 2.0 though again, can someone confirm this? Have you got C type of iWork 10? I have TD (mrousB 3.0) version and micro USB 3.0 port works at 3.0 speed. But I do not know why when I tried the ports first it worked at 2.0 mode only. I had updated Windows and it worked at 3.0 speed. So update Windows try other usb 3.0 device (HDD, USB drive) and it may be will help. is there any new information about that topics? I have a Chuwi hibook pro and my sdcard perf. is really bad. That leads me to the assumption that it must be a combination of driver issue … . Or a problem with the sd card reader in the tablet.